The 2015 ISWA Awards before the presentation ceremony. They were designed and made by the upcycling sculptor Evy Puelinckx from found materials. Professor David C Wilson and his co-authors have won three prestigious publication awards. Their paper ‘Wasteaware’ benchmark indicators to measure the performance of a city’s SWM system won two awards for the best paper published in 2014-15: the 2015 ISWA Publication Award and CIWM’s 2014-15 James Jackson Medal. The earlier 2012 paper in the same series, Comparative Analysis of Solid Waste Management in 20 Cities, won the inaugural WM&R Best Paper Award 2014, for the most cited paper published in the previous two years in the ISWA peer-reviewed journal Waste Management & Research. 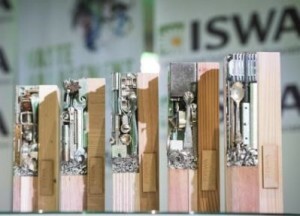 The ISWA Publication Award citation noted that the ‘Wasteaware’ paper ‘… contributes to one of the major issues in … solid waste management (SWM) in developed and developing countries … has the potential to assist many countries in the world (in) developing sustainable and integrated SWM strategies.’ The two ISWA awards were presented at the ISWA 2015 World Congress in Antwerp on Tuesday 08 September, when DCW received two trophies designed and made by the upcycling sculptor Evy Puelinckx. The James Jackson Medal will be presented at the annual CIWM Sustainability and resource Awards at the London Marriott on 5 November 2015. Professor David C Wilson, Ljiljana Rodic, Costas Velis and Anne Scheinberg are co-authors of both papers. The remaining co-authors of the Wasteaware indicators paper are Mike Cowing, Andy Whiteman, Recaredo Vilches, Darragh Masterson, Barbara Oelz and Joachim Stretz; and of the 20 Cities paper, Graham Alabaster.